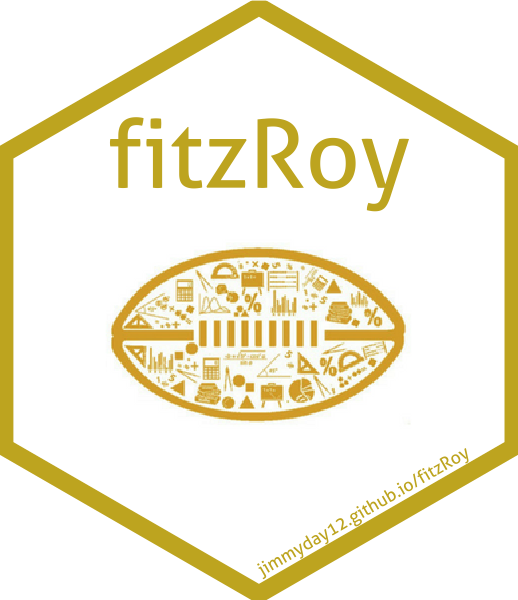 The goal of fitzRoy is to provide a set of functions that allows for users to easily get access to AFL data from sources such as afltables.com and footywire.com. There are also tools for processing and cleaning that data. Future versions will include basic ELO processing functions. The fitzRoy package can be used to simply get data from various sources. Primarily, the tool can be used to access data from various sources. Data is included in the package and can be access directly however this will not be up to date. Each source of data has functions for updating data during the season. Various data is included from both AFL Tables and Footy Wire. At the most basic level, you can access match results and the upcoming fixture as below. Read the full Mens Vignette for further instructions. From 2019, we are able to provide access to AFL Women’s data. Read the full AFL Womens Vingette for details on how to access it. A specific use case might be to use fitzRoy data as an input into a model. See the ELO model vignette for an example of how this might be done. fitzRoy now provides Docker support in the form of an image hosted on DockerHub. Once you have the images, (e.g. docker pull jimmyday12/fitzroy:latest) run one of the following commands. docker run -it jimmyday12/fitzroy:latest R to start with an R terminal prompt. To build the Docker image run the following from the root of the repository. docker build -t jimmyday12/fitzroy:latest -f docker/rstudio/Dockerfile . Please note that the ‘fitzRoy’ project is released with a Contributor Code of Conduct. By contributing to this project, you agree to abide by its terms.